As many of you know, recon is crucial to a successful hack/pentest. In most cases, hackers spend more time doing good reconnaissance than actually hacking. Without proper recon, you are simply guessing at what type of approach or exploit is going to work and, as a result, your time is wasted without any useful outcomes. I encourage you to start with these reconnaissance tools and others before even considering hacking/exploitation. 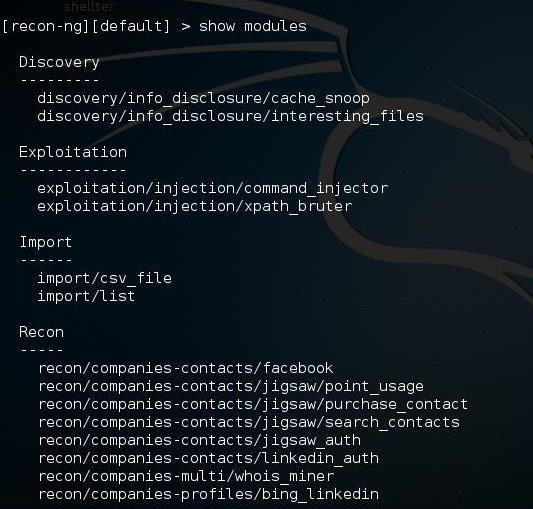 In recent years, a brand new reconnaissance framework has become available to us that leverages many of the tools we are already using, but makes them far more powerful. This tool, Recon-ng, was developed by Tim Tomes while at Black Hills Information Security. He developed it as a Python script and tried to model its usage after Metasploit, making it easy for a pentester with Metasploit skills to use Recon-ng. It is built into Kali, so there's no need to download or install anything. Let's explore its many and powerful capabilities a bit here. This will open a splash screen like below. Note that the splash screen lists the number of modules by type. Unlike SET, but rather like Metasploit, we use commands and not numbers to use Recon-ng. At the prompt, let's type help in order to look at the commands we can use in Recon-ng. 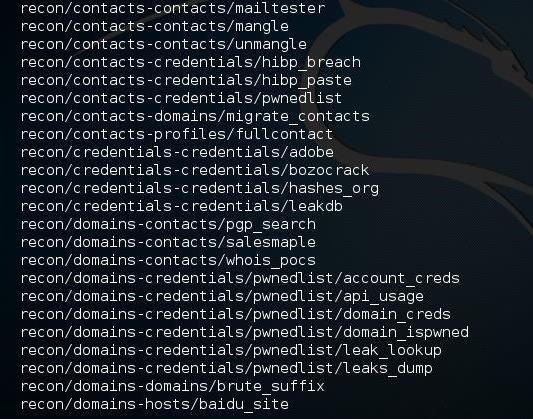 Note that many of these commands are nearly identical to Metasploit including back, set, use, search, show, and unset. Since there are 84 modules in Recon-ng, I can't fit them all on one screen, or for that matter, even two. One of the strengths and beauties of Recon-ng is the use of various application programming interfaces (APIs) to extract useful recon information. 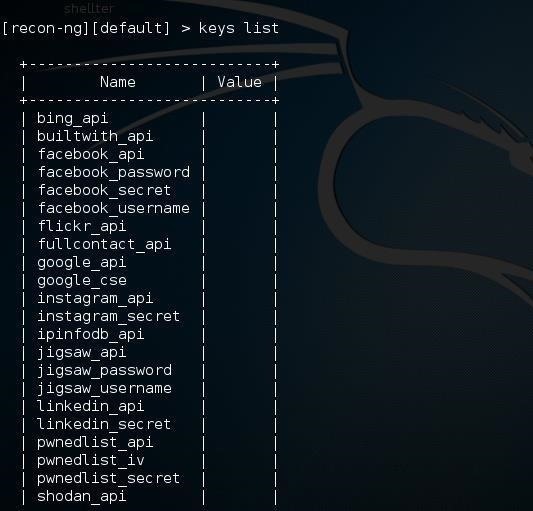 For instance, Recon-ng can use Bing, Google, Facebook, Instagram, LinkedIn, and other online applications once you get the API key. With that key, you have almost unlimited access to that application. As we can see, these are all the API keys that Recon-ng can use. Some are free and some you must pay for. 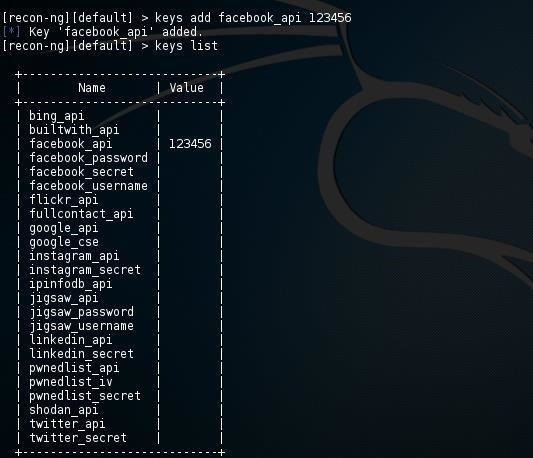 Now when you list the keys, you can see that your facebook_api key is listed. This means that when you use the Facebook recon module, it will automatically use this key to access Facebook like a Facebook application would. Note the similarity to Metasploit syntax. As you can see above, the only option we need is the website we want to scan. Let's scan our favorite website, WonderHowTo.com, to see whether it has any known XSS vulnerabilities. Now, let's try scanning the website of the leading IT security training company in the U.S., SANS.org, which teaches many courses on website and web app security. Notice that our good friends at SANS.org have not secured their own website. We found two vulnerabilities from 2015. 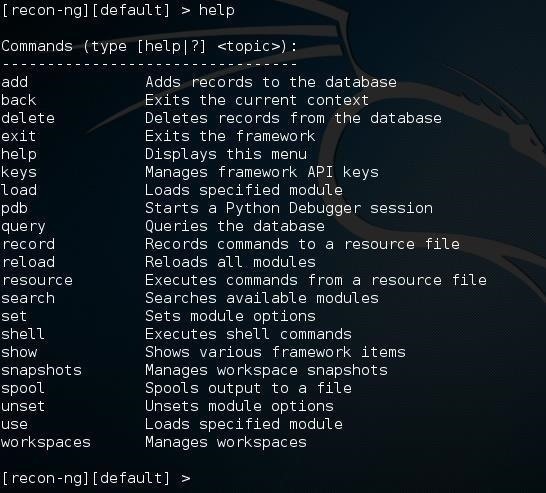 Recon-ng is one more tool in our hacker/pentester toolbox that provides us powerful capabilities for gathering necessary info on the target. In future tutorials in this series, we will explore its many varied capabilities, most particularly using APIs to garner key info on our target. So keep coming back, my novice hackers! Thanks for this great article OTW!! @ OTW : how do you rate this tool among Nmap, Hping3, Shodan, Netcraft ,Maltego??? You can't really compare them as they all do different things. Either you don know how Recon-NG works and/or you simply don't read. 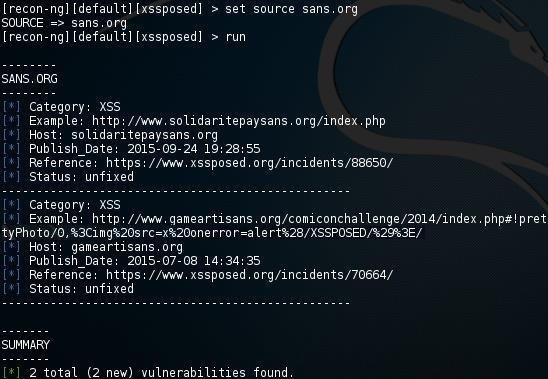 The XSS module is matching any URL that contains the string SANS.ORG. The two vulnerable domains are solidaritypaySANS.ORG and gameartiSANS.ORG. They simply have that string as PART of the URL. If you came to me as a professional penetration tester and told me I was vulnerable and pointed to other peoples websites that would be the last job you did for me. Are there other articles on recon-ng? Can't seem to find any using the search function.